https://www.kipling-usa.com/alcatraz-ii-printed-rolling-laptop-backpack/100241868.html Alcatraz II Printed Rolling Laptop Backpack The Alcatraz II Printed Laptop Backpack offers room for your laptop and airline carry-on acceptable! Able to be wheeled or carried backpack style. Innovative features allow for use as carry-on luggage or a back-saving solution for students with a heavy homework load. I ordered a monogrammed bag and it arrived without any monogram. The bag is very large and super heavy. It is too large for a school locker. This piece was ordered for my 11 year old girl for school and she can barely lift it empty. Add in a laptop and notebooks and this is a definite no go. We are so very sorry to hear for all the troubles you've had with this item. It looks like the monogramming didn't go through right for the item as a system error. If you would like to return it let us know and we can certainly see what we can do for you! We are so very sorry you also didnt like the item and can assist you with finding an alternative also. The bag was really nice my daughter r ally lived the color. The bag is really spacious which is perfect for high school. The limits her use of them lockers as she is able to carry all the books at one time. Being on wheels was certainly a plus because she’s so petite. The laptop pocket was able to hold her 17 inch laptop. 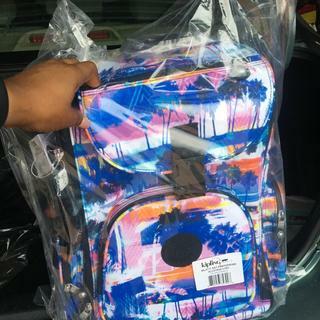 The bag is really nice. My Daugther loves it very much. as expected and better! design is beautiful and strudy!! My daughter loves this backpack. High quality material, lightweight & fun pattern! I bought this backpack for my 5th grader and she loves it. Very stylish, great size and compartments. Very cute and lots of space! The print is what my daughter loved, the reviews about quality were why I agreed. Hoping it's perfect! I purchase this laptop backpack for my son for school and travel also put his name on. I am compare with backpack but I like this one more. The colors so bright and pretty. It looks very pretty and different . my daughter is your biggest fan, every year she gets a different one. I have to admit that they are pretty cool!